1. Tests to order for patient with Hyponatremia: S Osm, U- Osm, U-Na, U-K. Why do we order these tests? 2. Case examples and what went wrong..
What are the 3 physiological mechanism for hyponatremia? What are the 2 hormones involved in hyponatremia and what will be the renal effect of these two hormones and what role do they play in these 3 mechanism of hyponatremia? Case 1: SIADH : 64 yo M with Hx of EtOH use, significant tobacco use, cirrhosis comes with N, and V of 3 days. Na is 110. S-Osm is 240. U Na is 100. U -Osm is 400. BP is 100/60. HR 90. ER Rx: Patient received 2 L NS bolus, and in 4 hrs, Na decreased to 105. What went wrong? Case 2: Hypovolumia: Same patient. ER Rx: Patient received 2 L NS bolus, and in 4 hrs, Na increased to 120. Patient voided significant amount of Urine during that time. The rate of correction was rapid that it had to be. What went wrong? ER Rx: Patient received 2 L NS bolus, and in 4 hrs, Na increased to 115, but patient retained all the fluid and made the edema worse. Patient fluid status got worse. What went wrong? U Na is 10. U -Osm 40. BP is 120/60. HR 95. ER Rx: Patient received NS bolus at 100 cc / hr, and in 4 hrs, Na increased to 120. What went wrong? a. Hypovolumic (different from dehydration): You can give more fluid with RL (130 meq/L) than with NS (154 meq/L). If overcorrection occurs, then give DDAVP. c. Hypervolumic: Volume Restriction: AVP antagonist?? d. Pseudo-hyponatremia: Glucose high, Mannitol, TG, Other Proteins etc. 5. Balance of Electrolytes "IN/L of fluid given" and "Electrolyte OUT/L of Urine Output" will define if Plasma Na is going to increase or not - i.e Understand the concept of Hypotonic Urine (more free water loss in Urine) in correction of hyponatremia. Both Thiazides diuretics, and Loop Diuretics cause diuresis, and volume depletion. Loop Diuretics leads to Hypernatremia, while Thiazide Diuretics leads to Hyponatremia, Why? Ans: More free water loss than sodium in Loop Diuretics, and more Sodium Loss compared to free water in Thiazides. Both case due to fluid loss have more ADH, and Aldosterone. Both act distal to where Loop and Thiazide Diuretics act. Then why such a different in fluid loss in two situations. Ans: Na K 2Cl- Channel that loop diuretics block is needed to maintain the medullary concentration gradient. NaCl- channels that thiazides blocks does not have much role in medullary gradient. Medullary gradient is needed for ADH to retain free water. In the absence of gradient, even though there is plenty of ADH, no free water is retained in loop diuretics use, whereas that free water is retained with thiazide diuretics. Free water retention causes hyponatremia in Thiazide. Free water loss causes hypernatremia in Loop Diuretics. What effect does ADH do on NK2Cl- channels? How does oxcarbamazepine cause hyponatremia? What is Urine Osmolality in Euvolumic Hyponatremia? U-Na? U-Som is High due to high ADH (SIADH). U-Na is high as low aldo causes loss of U-Na. 22 yo M patient with Schizophrenia was seen for fall. Was found to have S-Na of 113. S-osm was 240. U-osm is 46. U-Na is 6. Describe the pathophysiology of Hyponatremia in this patient? 1. Low ADH: Hence, U-osm is low. 2. Hyponatremia is due to lack of enough Salt to drive out the water from body. Hence, it is as low as it can be. This is a perfect example of hyponatremia due to Primary Polydipsia. Ans: While fluid restriction alone with regular diet (that has salt) will work, Salt repletion is the best answer, as that can drive out the water. This is highly affective since ADH is very low. Do not replete a lot of salt, as that will lead to rapid diuresis, and rapid correction of S-Na. At, around 4 am, it was 116. Hence, IV fluid was changed to 1/2NS with K+. Fluid continued at 75 cc / hr. Subsequent changes are as above. At, 730 am it was changed to 1/4 NS with K+. Na, continued to increase. What could have been done upfront to minimize the risk of such a rapid correction of Na. 1) Instead of 75 c / hr, NS could have been run at 25 cc / hr. That limits amount of Na, and amount of diuresis it can cause, and decreases the rate of correction. 2) At 730 am, since Na continued to go up, instead of changing the 1/4NS with K+, it should have been changed fully to D5, and needed to be given at a rate more than what kidney can handle. i.e @ 250 cc / hr. That would cause hyponatremia, and make sure it reverses. What is the role of S-K+ in hyponatremia, and how does its correction affect S-Na. Further explanation on how hypokalemia causes hyponatremia, and how potassium repletion causes correction of hyponatremia. Hypokalemia is an independent predictive factor for the development of hyponatremia. Because intracellular and extracellular osmolality are always equal, loss of either sodium or potassium, unless accompanied by loss of water, would result in hypotonicity. Although it is intuitively evident why changes in body sodium and water levels should determine serum sodium concentration, the role of potassium is less obvious, but nevertheless is very important. Edelman et al showed that serum sodium concentration is a function not only of total exchangeable sodium and total-body water, but also of total exchangeable potassium. The primary mechanism is that potassium depletion results in a shift of sodium into the cell with a commensurate exit of potassium from the cell into extracellular fluid. The reverse occurs during potassium repletion and explains Laragh’s observation that oral potassium chloride administration resulted in an increase in serum sodium levels in hyponatremic patients in the absence of administered sodium. A similar observation was reported by Fichman et al in patients with diuretic-induced hyponatremia and hypokalemia. This effect of potassium repletion to increase serum sodium concentration may be enhanced by the entry of chloride into cell along with the potassium, which renders the cell hypertonic and draws water from the extracellular fluid. Potassium entry also may be accompanied by the movement of hydrogen ions from the intracellular to extracellular space, where they are buffered and thereby made osmotically inactive. This would decrease effective extracellular tonicity, again causing water to move into the cells, increasing the extracellular concentration of sodium. Whichever mechanism is dominant, the important observation is that potassium depletion could be associated with hyponatremia, and potassium repletion results in an increase in serum sodium concentration. 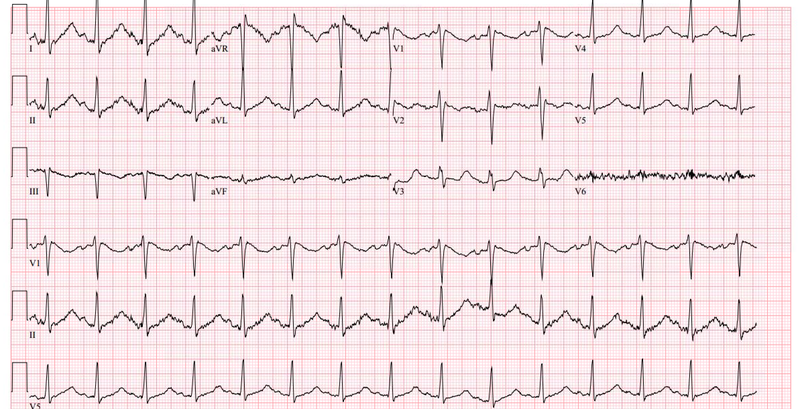 Hence, rapid correction of Na in this patient may very well have been partly related to the correction of hypokalemia. 36 yo comes with following. 3) An increase in the amplitude of U waves which occur at the end of the T wave. U waves are often seen in the lateral precordial leads V4 to V6. Patient received 1 L NS bolus in ER. Also, was repeated aggressively with K. Subsequent BMP are as follow.